Asystole colloquially referred to as flatline EKG (electrocardiogram), represents the cessation of electrical and mechanical activity of the heart 1). Asystole is identified on cardiac monitoring. In asystole, there is no waveform present on the cardiac monitor, only an isoelectric “flat” line. This includes a lack of P-waves, QRS complexes, and T-waves. Asystole typically occurs as a deterioration of the initial non-perfusing ventricular rhythms: ventricular fibrillation (V-fib) or pulseless ventricular tachycardia (V-tach). Additionally, pulseless electrical activity (PEA) can cease and become asystole. Victims of sudden cardiac arrest who present with asystole as the initial rhythm have an extremely poor prognosis (10% survive to admission, 0 % to 2% survival-to-hospital discharge rate) 2). Asystole represents the terminal rhythm of a cardiac arrest. Asystole results from failure of the heart’s intrinsic electrical system or an extracardiac cause. Extracardiac causes are varied. They include the Hs and Ts discussed below and their causes. Asystole typically occurs as a deterioration of the non-perfusing ventricular rhythms. If not rapidly corrected, electrical and mechanical cessation of cardiac activity will occur. This is manifested as asystole on the cardiac monitor. The findings of cardiac arrest are straightforward. A patient who is in cardiac arrest is unresponsive to all stimuli and is without spontaneous breathing or a palpable pulse. The American Heart Association (AHA) has simplified their basic life support cardiac arrest algorithm to encourage minimal compression interruption. The current algorithm has eliminated the “look, listen, and feel” step to check for breathing in an unresponsive patient. Instead, the rescuer should observe to see whether the patient is breathing normally. Emphasis is placed on “gasping” or agonal breathing being abnormal. If the patient is not breathing or only has agonal respirations, the rescuer should check for a carotid pulse for the unresponsive adult or the brachial pulse in the unresponsive infant for no more than 10 seconds. If a pulse is not felt or the rescuer is unsure if a pulse was felt, CPR should be initiated immediately. PEA is short for pulseless electrical activity, also known as electromechanical dissociation, is a clinical condition characterized by unresponsiveness and impalpable pulse in the presence of sufficient electrical discharge 3). A lack of ventricular impulse often points to the absence of ventricular contraction, but the opposite is not always true. It means that the electrical activity is a pertinent, but not sufficient, condition for contraction. In case of cardiac arrest, the organized ventricular electrical activity does not usually follow sufficient ventricular response. The word “sufficient” is being used to describe a degree of ventricular mechanical activity that is adequate to generate a palpable pulse. PEA (pulseless electrical activity) does not necessarily mean the lack of mechanical activity. There can be ventricular contractions and detectable pressures in the aorta which are also known as pseudo-PEA. True PEA (pulseless electrical activity) is a state in which cardiac contractions are lacking in the presence of coordinated electrical impulses. Pulseless electrical activity can include a number of organized cardiac rhythms that may be supraventricular in origin (sinus versus nonsinus) or ventricular in origin (accelerated idioventricular or escape). An impalpable pulse should not always be taken as a PEA (pulseless electrical activity) because it may be due to severe peripheral vascular abnormality. The incidence of PEA (pulseless electrical activity) is different among different United States patient populations. PEA (pulseless electrical activity) accounts for approximately 20% of sudden cardiac deaths outside of the hospital setting 4). A study found that 68% of the recorded in-hospital deaths and 10% of all in-hospital deaths were attributed to pulseless electrical activity. In addition, the hospitalized patients are more likely to suffer from pulmonary embolism among other complications. PEA (pulseless electrical activity) is the first documented rhythm in 30 to 38% of adults with in-hospital cardiac arrest 5). Beta blockers and calcium channel blockers may alter contractility, leading to increased susceptibility and resistance to treatment. Females are more likely to develop PEA (pulseless electrical activity) as compared to the male population. The risk of pulseless electrical activity increases over the age of 70, especially in the female population. Testing should include an EKG, arterial blood gas analysis, serum electrolytes, core body temperature, chest X-ray, and echocardiogram. Patients who have sudden cardiac arrest due to PEA (pulseless electrical activity) also have a poor outcome. In one study of 150 such patients, 23% were resuscitated and survived to hospital admission; only 11% survived until hospital discharge 6). The cause of PEA (pulseless electrical activity) is classified into primary/cardiac and secondary/noncardiac causes. Primary pulseless electrical activity, often caused by or related to cardiac arrest is due to depletion of myocardial energy reserves. It responds poorly to therapy. Thrombosis (both pulmonary and coronary). Pulseless electrical activity occurs when an insult involving cardiovascular system, gastrointestinal tract or the respiratory system results in the inability of the cardiac muscle to generate adequate force in response to electrical depolarization. This adverse event decreases cardiac contractility, and the situation gets severe by potential acidosis, hypoxia, and worsening vagal tone. More compromise of the inotropic state of the cardiac muscle leads to insufficient mechanical activity, despite the presence of electrical activity. It causes degeneration of cardiac rhythm, and eventually, death follows. Decreased cardiac contractility has been related to changes in intracellular calcium levels, which explains why patients with beta blockers or calcium channel blockers are more prone to developing pulseless electrical activity and may become unresponsive to therapy. The first step in managing pulseless electrical activity is to start chest compressions according to Advanced Cardiac Life Support (ACLS) protocol along with using epinephrine, while simultaneously looking for any reversible causes. Once a diagnosis is made, begin immediate management i.e., decompression of pneumothorax, pericardial drain for tamponade, fluids infusion, correction of body temperature, administration of thrombolytics, or surgical embolectomy for pulmonary embolus. Drugs used include epinephrine and atropine. Epinephrine should be administered in 1 mg doses intravenously/intraosseously (IV/IO) every 3 to 5 minutes during pulseless electrical activity arrest. Higher doses of epinephrine have not shown to improve survival or neurologic outcomes in most patients. Selected patients, like those with beta blockers or calcium channel blockers overdose, may benefit from higher-dose epinephrine. If the detected rhythm is bradycardia that is associated with hypotension, then atropine (1 mg IV q3-5 min, up to three doses) should be administered. This is considered the optimal dose, beyond which no further benefit will occur. Note that atropine may cause pupillary dilation; therefore, this sign cannot be used to assess neurologic function. NaHCO3 may be used only in patients with severe, systemic acidosis, hyperkalemia, or tricarboxylic acid overdose. The dose is 1 mEq/kg. Avoid routine administration of sodium bicarbonate as it worsens intracellular and intracerebral acidosis without affecting mortality. Pericardial drainage and emergent surgery may be lifesaving in appropriate patients with pulseless electrical activity. In a patient with a refractory case and chest trauma, a thoracotomy may be performed. Near pulseless electrical activity or a very low-output state may also be managed with the circulatory assistance (e.g., intra-aortic balloon pump, extracorporeal membrane oxygenation, cardiopulmonary bypass, and ventricular assist device). Causes of asystole in cardiac arrest are wide and varied. Asystole typically results from decompensation of prolonged ventricular fibrillation arrest. Additionally, attempted defibrillation of ventricular tachycardia or ventricular fibrillation can precipitate asystole. However, any cause of cardiac arrest can eventually result in asystole if not promptly treated. When evaluating a patient with an initial cardiac rhythm of asystole, the reversible causes must be considered. A useful mnemonic taught in Advanced Cardiac Life Support, for the reversible causes of cardiac arrest, involves the Hs and Ts. When identified, these cases should be immediately treated 7). Asystole should be treated following current American Heart Association basic life support and ACLS (Advanced Cardiac Life Support) guidelines. High-quality CPR is the mainstay of treatment and the most important predictor of favorable outcome. 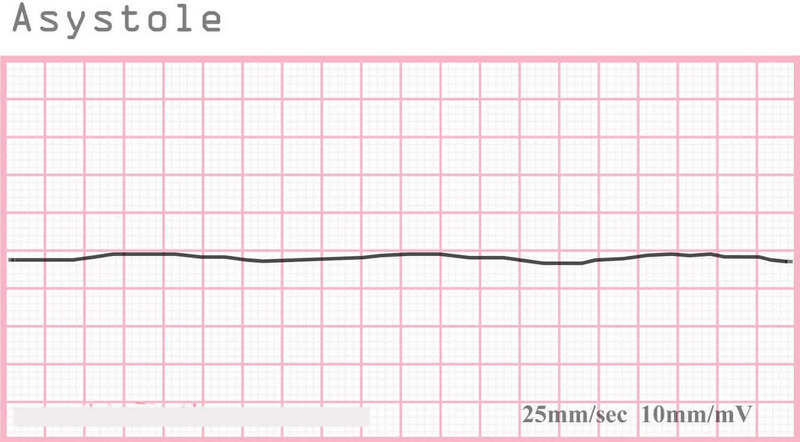 Asystole is a non-shockable rhythm. Therefore, if asystole is noted on the cardiac monitor, no attempt at defibrillation should be made 8). High-quality CPR should be continued with minimal (less than five seconds) interruption. CPR should not be stopped to allow for endotracheal intubation. Epinephrine (1 mg via intravenous or intraosseous line) should be delivered every three to five minutes and treatment of reversible causes addressed. Asystole is considered a terminal rhythm of cardiac arrest. Therefore, discussion of termination of resuscitation should be considered during an in-hospital cardiac arrest in the appropriate clinical picture. Out-of-hospital cardiac arrest patients in asystole should also be considered for the cessation of efforts according to local protocol 9). 2. ↵ Chan PS, Jain R, Nallmothu BK, Berg RA, Sasson C. Rapid Response Teams: A Systematic Review and Meta-analysis. Arch. Intern. Med. 2010 Jan 11;170(1):18-26. 7. ↵ Kleinman ME, Goldberger ZD, Rea T, Swor RA, Bobrow BJ, Brennan EE, Terry M, Hemphill R, Gazmuri RJ, Hazinski MF, Travers AH. 2017 American Heart Association Focused Update on Adult Basic Life Support and Cardiopulmonary Resuscitation Quality: An Update to the American Heart Association Guidelines for Cardiopulmonary Resuscitation and Emergency Cardiovascular Care. Circulation. 2018 Jan 02;137(1):e7-e13.